Vera is a shiny, serene green bird of prey sculpture made of a golden stoneware clay. Her eyes are impressed with two vintage buttons and a portion of a monstera leaf rubber stamp graces the top middle of her head. She has a sweet, curious head tilt. 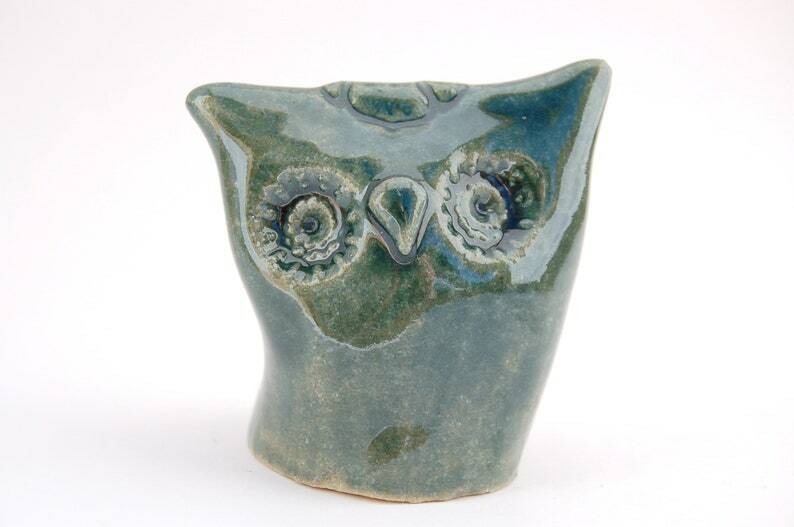 After bisque fire, she was brushed with multiple coats of a dark green, translucent celadon glaze. She has a smooth high gloss finish all over. Vera measures 2.5 inches wide and tall. She has a depth of1.75 inches overall. She would make a lovely little companion for an owl lover.